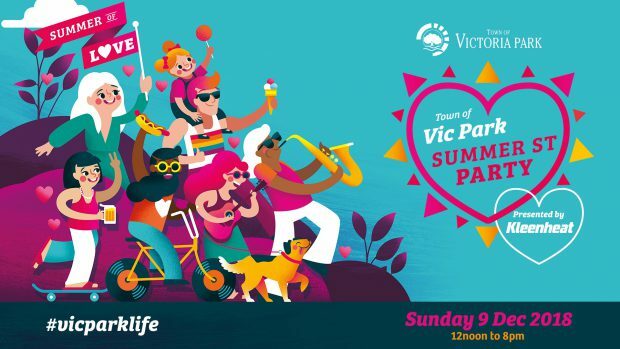 The Town of Vic Park Summer Street Party presented by Kleenheat returns to the urban village of Victoria Park, delivering another great series of attractions to suit all ages and tastes. This year’s theme is ‘The Summer of Love’ with 50,000 people expected to attend. The Albany Hwy café strip will be transformed into an entertainment and cultural hotspot, which aims to bring together the entire community. Previous years have included huge activations from local businesses, a huge variety of market stalls and street food, plus live entertainment taking place in multiple areas around the festival and this year for the first time ever, we are set to include a very special presentation of local talent – the inaugural #VICPARKUNEARTHED. This summer street party event is one that is not to be missed!